I’m slowly expanding my home automation systems and the latest addition to that is this weather station. The large rectangular thing in the lowest position on the antenna pole is a WIFI panel antenna. 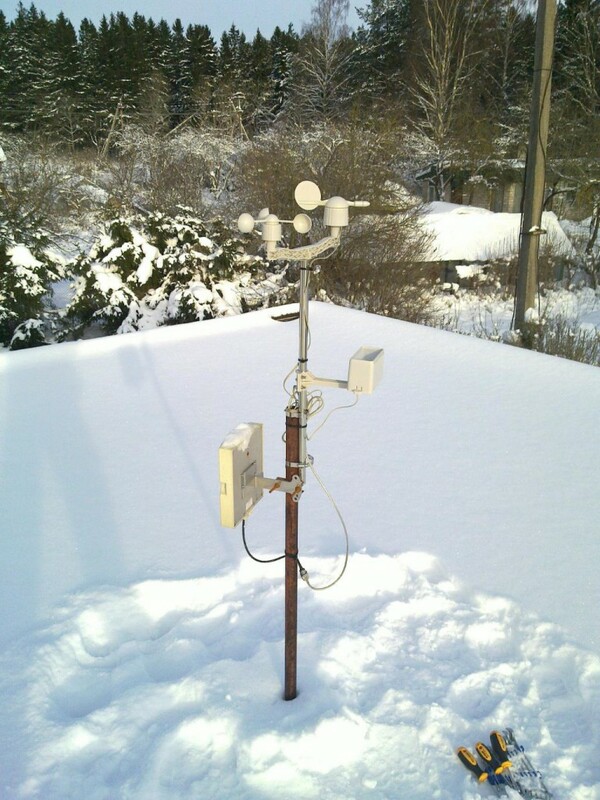 I wanted a relatively cheap and open weather station that I could integrate into my setup without too much effort. The closest match seemed to be this one that is sold by Sparkfun. It has an anemometer, wind vane and rain gauge. Interfacing it with a microcontroller is very simple since the wind speed and rain gauge are just Reed switches and the wind vane changes resistance. The only external component that you need is a 10k ohm resistor for the wind vane and of course some kind of microcontroller to take the measurements. I ordered mine for 60€ from Watterott electronics which is a German shop that sells a lot of Sparkfun stuff among other things. 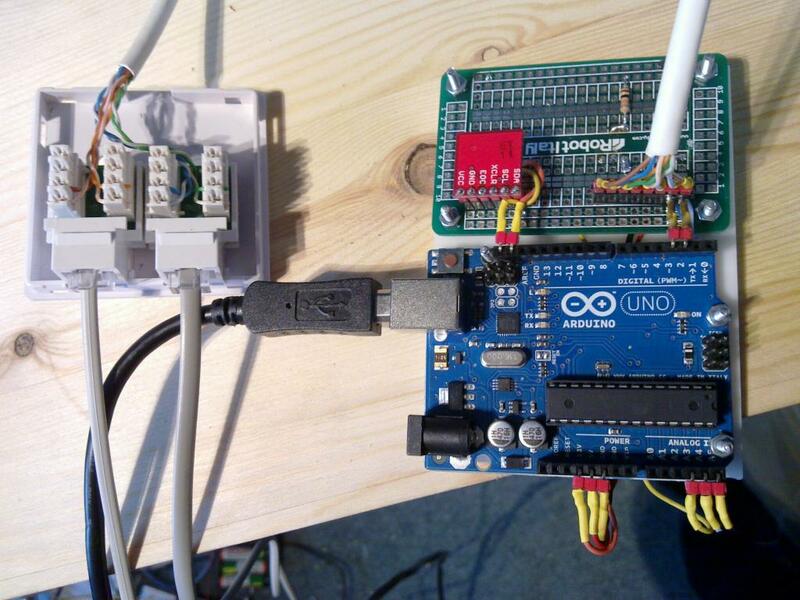 I hooked it up to an Arduino Uno using a small library that I wrote and connected that in turn over a USB cable to a beagleboard that serves as a controller for my home automation stuff. The small red board on this picture is a BMP085 barometric pressure sensor. 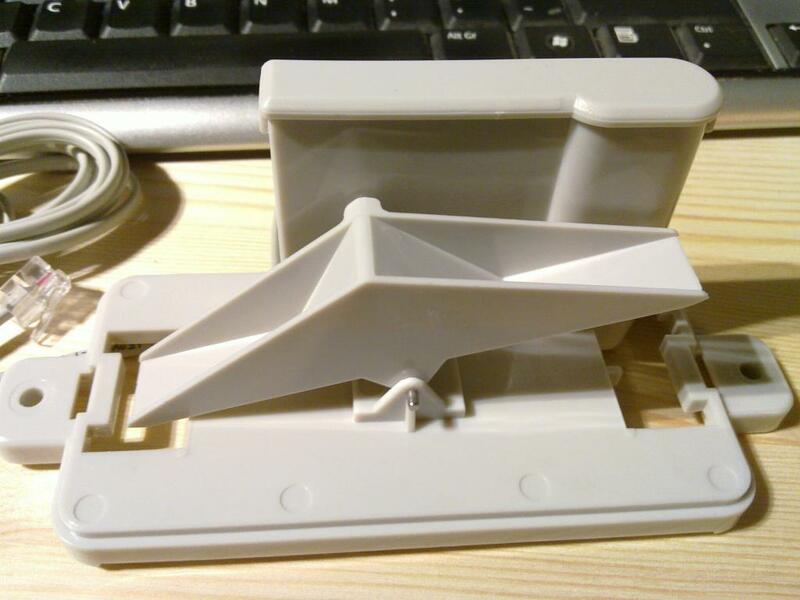 Inside you will find a seesaw with 2 buckets with a magnet in the pivot that triggers contact in the Reed switch every time the equilibrium position is changed. While the design of the rain gauge is beautiful in its simplicity it doesn’t seem to be very precise. For example sometimes the other end will bounce right back after emptying and I have no theory yet about the reason behind the random small measurements that I currently get from it. 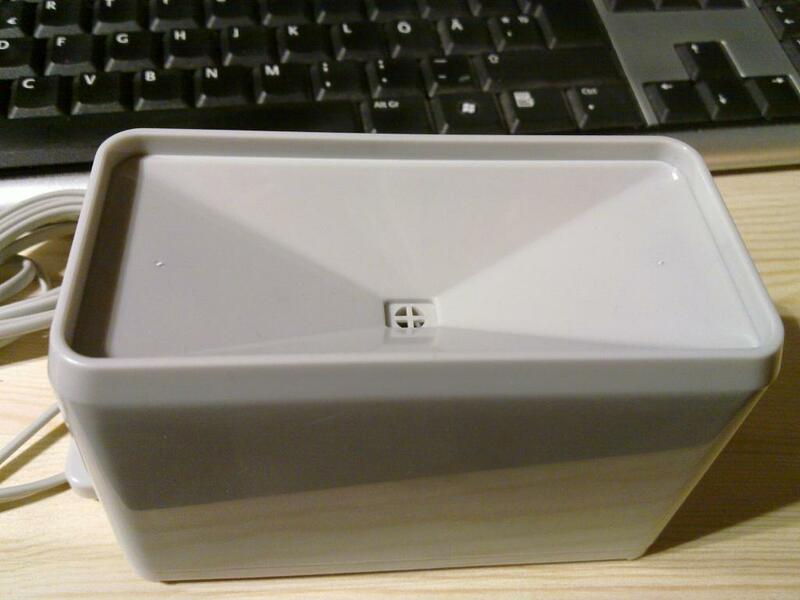 This entry was posted in hacks and tagged domotics on February 5, 2012 by hadara. Hmm noh kui euroopas too junn tellida siis tuleks ilmselt sama number (450) aga eurodes. Minu kulud otseselt ilmajaamale siiani on olnud 60 euri katusele mineva osa eest, 20 euri arduino eest (ilmselt lähen sinna külge veel ka muid asju), 20 euri õhurõhk + temperatuuri sensor. Seega 100 euri. Kui nüüd tahta mingit ilusat ekraani ka seinale siis võiks 100 euri eest mingi hiina androidi tableti osta. Kokkuvõttes võiks seega umbes 200 – 250 euriga hakkama saada + screen oleks oluliselt multifunktsionaalsem. Mul oli kontroller muidugi beagleboardi näol anyway olemas ja see tegeleb lisaks ilmale ka miljoni muu asjaga. Ekraan seinal mulle eriti huvi ei paku.